John and I slept in the morning after the MGM 3-Gun match. After repacking everything and grabbing some breakfast, we jumped back on I-84 and headed westward into Oregon. We have visited Oregon twice before, but this was the first time we’d been in this particular part of the state. Our original plan was to make a side trip into the Wallowa Valley, but it would have taken us several hours out of our way. Because of our late start, we had to scotch that plan and instead, allowed ourselves the luxury of getting off the interstate whenever we saw something interesting. Hence, when we saw signs to “Oregon Trail Interpretive Site,” we jumped off the interstate and took a couple miles worth of back roads to have a look. One of the interesting things about Oregon is its honor system for state park usage. There’s a nominal fee for entering the parks; envelopes are provided and it’s up to you to put in the correct amount and deposit it in the fee box. The fee for the Oregon Trail Interpretive Site was $5.00, but we only had a $10 bill. We took the envelope along with us, hoping for a chance to make change. The site itself was self-guided, and the first thing we saw was another couple looking through binoculars. “What do you see?” I asked, and they pointed out a doe with two tiny spotted fawns, right at the edge of some nearby woods. We got a glimpse of them before the doe spooked and herded her two tottering infants into the trees. We wandered on, down a trail that meandered for a half mile through trees and meadows. 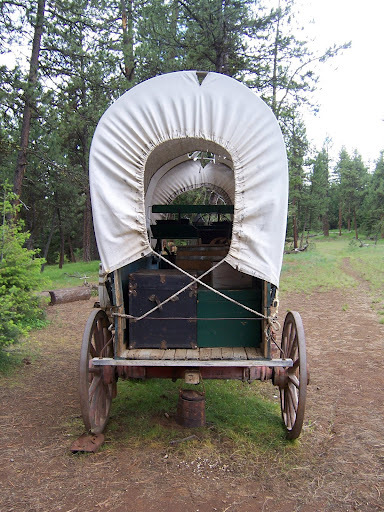 We met up with a volunteer guide who pointed out ruts left by the wagon wheels of the Oregon Trail pioneers so many years ago, and we visited a mock campsite (where I took this photo of a reproduction wagon). In all, it was a pleasant break from our highway travels, and we ended up leaving the $10 bill in the fee box. 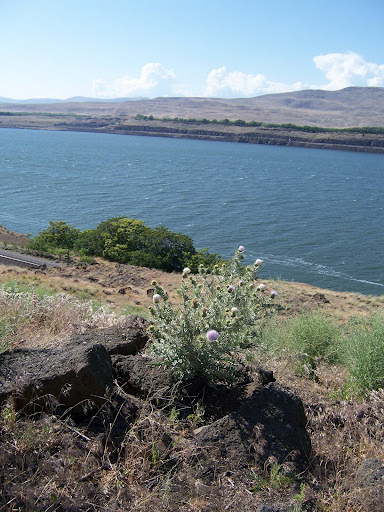 We continued up I-84, traveling through the Columbia Gorge and alongside the Columbia River for quite a few miles. If there was a scenic turnout, we took it. We stopped at a restaurant near the river’s edge and had a leisurely lunch. We got into the vicinity of Portland and jumped onto I-5 South, and by the time we turned off the interstate to head to the coast and Newport, it was already starting to get dark. We arrived at the Elizabeth Street Inn around 9:30 and checked in. We’ve stayed at the Inn before and I knew there was a laundry room on premises; I asked the nice lady if there was a cut-off time for using it in the evenings and she said no. We went up to our room and immediately opened the doors onto our balcony to enjoy the ocean breeze, even though it was too dark to see the water. I ran a couple of loads of wash and made us a quick dinner, then John and I collapsed for a good night’s sleep, with the beating of the waves providing a pleasant lullaby. In the morning we had some breakfast, then took Highway 101 (the coastal highway) south. 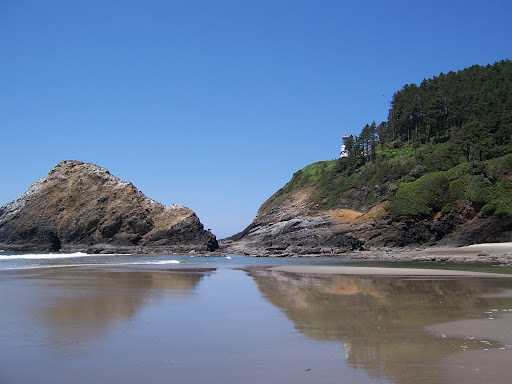 In our 2007 visit to the Oregon coast, we had spent most of our time headed north; this time we wanted to see what lay in the opposite direction. Our ultimate goal was the Sea Lions Caves near Florence, a couple hours south. We had expected the typical cool, damp and overcast day that you get on the Oregon coast at this time of year, but it stayed sunny and pleasant all day. 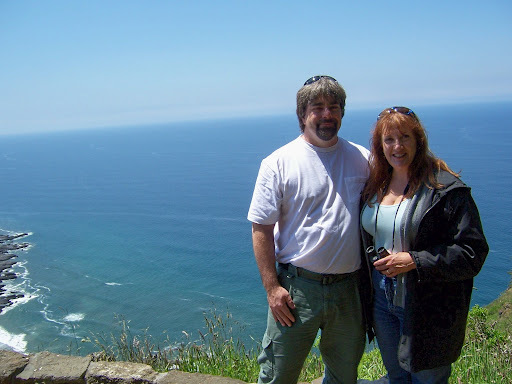 Upon our descent from Cape Perpetua, we continued to Heceta Head Lighthouse. I decided I’d rather not travel up to the lighthouse, but was content to look at it from the beach below, particularly after John asked if I wouldn’t like to spend some time looking at the tidal pools. 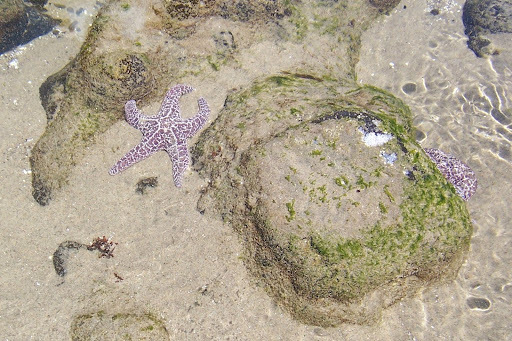 Now this was a great thing – during our 2007 visit, I really wanted to poke around the tidal pools on the various beaches we passed, but that sort of thing bores John to death, and I only got a few minutes of tidal-pool-poking. I think he felt guilty about it then, and as I’d been such an Exemplary Spouse during the 3-Gun match, I guess he figured he owed me. He even found me a Poking Stick to enhance the experience. The tide was coming in rather quickly but I still had time to play with a few crabs and snails and to find an enormous dead sea star – it must have been nearly a foot across. I toyed with the idea of taking it home to dry out, but was afraid it would stink too much. Now I wish I had it. Oddly, the best find of the tidal pool was John’s. While I was playing with a crab, he noticed these purple sea stars and pointed them out to me. They were really quite pretty – about five inches across, a lovely pale lilac color and stuck firmly onto their rocks (yes, I Poked them – gently). I looked them up on the Internet later and discovered that they are Ochre Stars, and like to dine on mussels and snails, via the charming starfish method of turning their tummies inside out. From Heceta Head we went to the Sea Lions Caves, just north of the town of Florence. It was a bit touristy, but the owners of the site seem to be going out of their way to provide sightseers with a good look at the Steller sea lions’ hangout and breeding site, and at the same time give the sea lions themselves plenty of space. You can watch the sea lions from a cliff lookout far overhead, then take an elevator down a couple hundred feet into the cave itself. The observation area is fenced off from where the sea lions like to hang out, and you’re not allowed to use flash photography in the cave. Those slug-looking things are the sea lions hanging out on the rock. There were about fifty of them in the cave, and another hundred and fifty or so on the rock ledges outside the cave. The cheeping sounds you hear on the video are swallows, which were swooping all over the interior of the cave. From the Sea Lion Caves, we went to Florence and had a late lunch of chowder at Mo’s, a well-known seafood place (well, places – there are five Mo’s on the Oregon coastline). Then we had a little ice cream, bought some salt water taffy and headed back to Newport. It was a really satisfying day, but when John asked me if I’d had enough tidal pool time, I had to confess that there will never be enough tidal pool time. Particularly when I have a good Poking stick.